Let me echo Christine’s congratulations to Steve Harris for a remarkable book. Christine has provided a superb summary of some of the main arguments in the text. So, rather than cover the same ground, I would like to address some of the ideas raised in the early chapters and to suggest some new questions for us to consider. Consistent with much recent scholarship, Harris dismisses artificial boundaries and chronologies that historians have foisted upon events. He searches for the roots of the khrushchevka both before Khrushchev and 1917. Similar to David Hoffmann and Peter Holquist, Harris argues, in the case of housing, that the Bolshevik Revolution was not truly revolutionary. Rather, Bolshevik housing policy shared much, although not everything, with Europe and tsarist Russia. Rapid industrialization, urban overcrowding, and the increasing fixation on public hygiene brought the “housing question” to the front pages in numerous European countries. World War I found many emerging welfare states, to varying degrees, constructing public housing for workers and returned soldiers. The Bolshevik Revolution created a “rupture in historical time” (p. 46) as Russia’s new regime began forcibly expropriating and redistributing private property. This break from the pan-European norm also led to the dreaded communal apartment in which a large (or not so large) house or apartment would be divided into several residences. However, architects and officials in Russia continued to discuss minimal living space norms much as did their European counterparts. 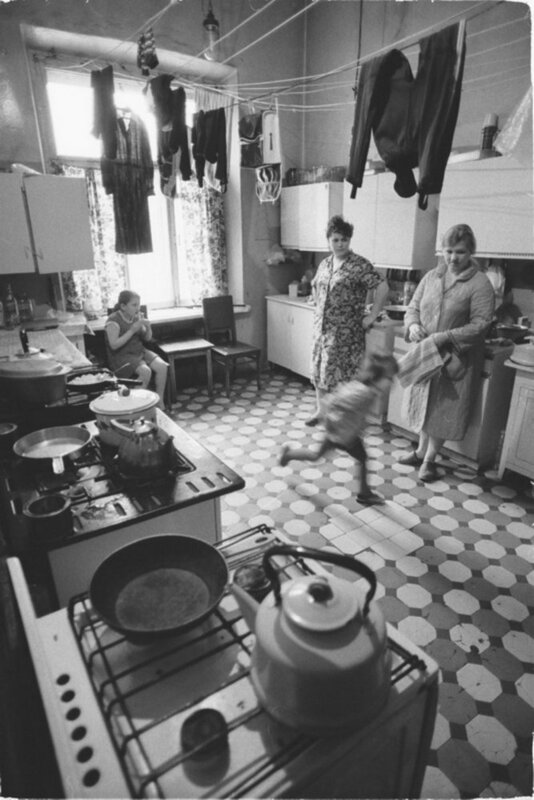 Harris correctly notes that during the attack on the nuclear family in the 1920s and Stalin’s reconstitution of the family ideal in the 1930s, architects continued discussions about the importance of living space norms. Harris makes a convincing argument that the notion of minimal living space drove apartment design in this period, but did architects also want to maintain professional standards as well? When the avant-garde architects of the OSA argued that kulturnost’ could only be spread with single-family, minimal dwellings and not communal apartments, was their motivation ideological or professional? In chapter two we learn that local officials subdivided apartments even slightly larger than the minimum norm and thus undermined the architects’ vision. Harris notes this concern in the architectural community, but I am wondering if architects protecting their “little corner of freedom” might have been as powerful a motivator for shrinking the size of apartments as was the desire to protect the single-family dwelling. In my reading of the architectural journals and archival records of architectural organizations in the 1930s and 1940s, I found numerous architects arguing for the importance of the integrity of design. Granted, most of these men were designing cities rather than individual apartments, but some, like the talented constructivist Moisei Ginsburg who is mentioned several times in Communism on Tomorrow Street, designed on both the large and small scale. Moreover, he survived the discrediting of constructivism and the shakeup in architecture in the late 1930s only to find himself granted numerous commissions after World War II, including one of the two much sought after offers to compete for redesigning Sevastopol. Harris quite rightly notes Ginzburg’s opposition to flexible housing that could be used in multiple ways. When in 1943 Ginzburg noted that “In the majority of cases the living units we designed were not used as we intended” (p. 75), this suggests to me that his shift from a communal ideal in the 1920s to stressing small, single-family apartments of standard designs and industrial construction was a way for him (and others) to preserve the integrity of their designs. Industrial construction raises a question that I would like to know more about: ferro-concrete. Yes, not the most exciting of topics…but without it one could not have had prefabricated, multi-story apartment buildings. The unparalleled urban destruction in World War II, as Harris notes, made a critical housing situation all that more dire. Although planning for the resurrection of cities began as early as 1943, reconstruction of permanent dwellings was slow until the late 1940s. It is at this point that small-scale use of ferro-concrete and industrial techniques began to replace mass hand labor. I wonder if the massive expansion of this type of construction a decade later was only a matter of Khrushchev’s dictate or whether he saw that construction methods had developed sufficiently so that they could be exploited on a larger scale. Finally, I would like to draw readers’ attention to chapter three’s fascinating discussion of housing distribution. Harris uses a case study of Leningrad, using closed-door stenographic records of meetings (among other sources), to show how Khrushchev’s desire for centralized and egalitarian distribution based on need fell victim to manipulation from individuals, enterprises, and the very officials charged with rationalizing distribution. To me, the latter are most culpable because, as Harris shows, they did not even follow their own rationalized lists. Rather, they used their discretion in assigning housing, sometimes based on need and at other times based on perceived merit or rights. This seems like a continuation of the age old dilemma of произвольность (arbitrariness) that was at the very core of Russian autocracy for generations. Readers, Steve Harris has produced a much needed book and done so with a clarity of writing and systematic research that makes for a thought-provoking read. All of us will need to reconsider our understanding of Khrushchev’s reforms and how he reconfigured social life, notions of privacy, and the connection between state and society through the mass housing explosion he initiated. I will leave it to my colleagues who are much better versed in the Khrushchev era than I am to discuss Harris’s chapter on furniture and the politics of complaint, which are wonderful additions to emerging research in these areas. David Hoffmann, Cultivating the Masses: Modern State Practices and Soviet Socialism, 1914-1939 (Ithaca: Cornell, 2011); Peter Holquist, “Information is the Alpha and Omega of Our Work,” The Journal of Modern History 69, no. 3 (1997), 415-450. Douglas A.Weiner, A Little Corner of Freedom: Russian Nature Protection from Stalin to Gorbachev (Berkeley: University of California Press, 2002). As Steve Bittner has noted, constructivism had a much longer shelf life than we had once assumed. Stephen Bittner, “Remembering the Avant-Garde: Moscow Architects and the ‘Rehabilitation’ of Constructivism, 1961-1964,” Kritika 2, no. 3 (2001): 553-76. Karl D. Qualls, From Ruins to Reconstruction: Urban Identity in Soviet Sevastopol after World War II (Ithaca: Cornell University Press, 2009), chapter 2. Kotkin, Magnetic Mountain: Stalinism as a Civilization (Berkeley: University of California Press, 1995); Polly Jones, ed. , The Dilemmas of De-Stalization: Negotiating Cultural and Social Change in the Khrushchev Era (London: Routledge, 2006), especially Miriam Dobson, “Show the Bandit-Enemies No Mercy!”, 21-40; Susan Reid, “Communist Comfort: Socialist Modernism and the Making of Cosy Homes in the Khrushchev Era,” in K. H. Adler and Carrie Hamilton, eds, Homes and Homecomings: Gendered Histories of Domesticity and Return (Oxford: Wiley-Blackwell, 2010); Susan Reid, “The Meaning of Home: ‘The Only Bit of the World You Can Have to Yourself,’” in Lewis Siegelbaum, ed., Borders of Socialism: Private Spheres of Soviet Russia (New York and Basingstoke: Palgrave, 2006), pp. 145-70. This entry was posted in Communism on Tomorrow Street, Soviet Era 1917-1991. Bookmark the permalink.